I am looking to see what handle bars there are that are just a little higher than the stock ones? I like the looks of the klz 100 but are they higher than stock? Is it possible to find out what mounts he bought? I do not have a fb account nor do I want one. I wonder how all the controls fit since the stock bar is 7/8. Would I have to by new controls? He said he went with the high option. Didn’t say what mount he went with. Check the sight out, it’ll give you an idea of what 7/8 to 1-1/8 mount/risers you’ll want to get to fit that bar. 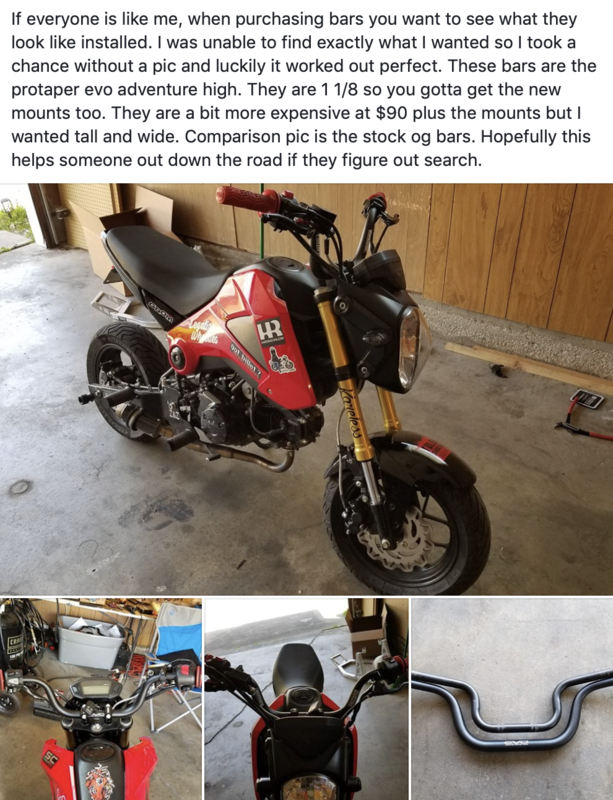 Actually I want to get the CB300F and replace its handlebars with the Grom handlebars to make it narrow so it can fit the same as the Grom for lane splitting. Do you guys think that this modification would work fine? I love the Grom for its way of handling the lane splitting on the streets but at the same time the CB300F has a 106 mph top speed and 70 mpg cruising speed vs. the Grom 60 mpg top and 40 cruising. Last edited by john2018; 04-09-2019 at 02:23 PM. They bolt right on. Only the mounting points are 1-1/8"
There are bars that are shorter or taller, as well as risers that are shorter or taller. How much height are you looking for? The bars from the facebook post above are considerably taller than the stock bar that it is sitting next to. You could just find a riser that will raise your current setup. Perhaps something like this https://www.tacticalmindz.com/collec...ebar-riser-kit, it'll give you a few options to play with different heights, a pretty decent price. If you want to stick with the 7/8th size the Pro Taper xr50 bend is at least a half inch to an inch taller than the stock bar. I was debating between the xr50 and the commonly done klx bend and after looking at the pro taper measuring specs I found the xr50's although a tad narrower were taller which I wanted to get without using risers.